Corymbia citriodora �Scentuous� is a grafted form of the popular Lemon Scented Gum. It is a small tree, making it ideal for smaller, space restricted sites. 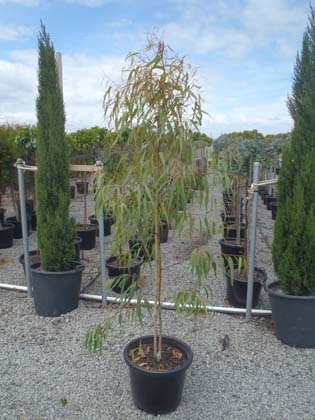 Corymbia citriodora ‘Scentuous’ is a grafted form of the popular Lemon Scented Gum. 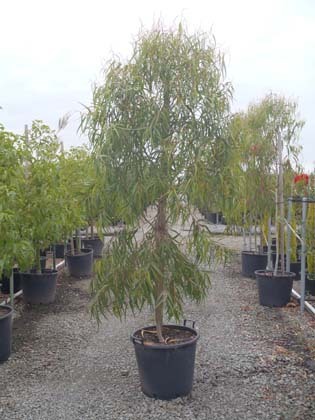 It is an ideal small Australian native specimen tree for domestic landscapes, and also an excellent performer in avenue or driveway plantings. Because of its uniform size and form, ‘Scentuous’ also makes an ideal street tree. For sites where a seed grown C.citriodora is desired, but cannot be utilised because of space or height restrictions, ‘Scentuous’ allows an architect or designer the features of a lemon scented gum, without the size issues. 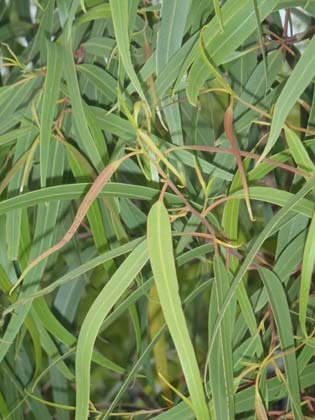 ‘Scentuous’ features smooth white bark, which is complemented by fine, softly weeping foliage and a strong, characteristic lemon scent. Flowers are white to cream and clusters are produced spring/summer. It is highly bird-attracting, making it a great addition to a native garden. ‘Scentuous’ is grafted to ensure compact mature height and form, so it is well-suited for street plantings or parklands where a uniform habit is required. A hardy small tree, ‘Scentuous’ will tolerate most soil types and conditions, but will perform best in full sun with a well drained soil. Botanix Plant Supply will have good numbers of 40cm stock available December 2012.